China has urged support for its probe into disgraced leader Bo Xilai, a day after news of his dismissal and the detention of his wife over the death of a UK businessman shocked the country. A widely-published piece in party newspaper People's Daily praised the "correct decision", saying it showed respect for the rule of law. Mr Bo's removal from key party posts was announced late on Tuesday. Mr Bo, 62, was once tipped as a future leader. But he has now been removed from his posts on the Communist Party's hugely powerful 25-member Politburo, and the 300-member Central Committee. His wife, Gu Kailai, is being investigated in connection with the death of British businessman Neil Heywood, Chinese authorities have also announced. British Prime Minister David Cameron welcomed the news. "We did ask the Chinese to hold an investigation and we are pleased that they are now doing that. It is very important we get to the truth of what happened in this very disturbing case, this very tragic case," he said on a visit to Indonesia. Wang Feng of the Brookings-Tsinghua Centre for Public Policy described the scandal as "almost unprecedented in China's political history". "For the last 30 years this is the biggest scandal we can think of," he told the BBC. It is difficult to know which piece of news is more startling - Bo Xilai's fall from grace or his wife's suspected involvement in murder. Mr Bo was until recently tipped for promotion when China begins its once-in-a-decade leadership change later this year. But he has now been suspended from the politburo, the 25-member body at the top of the Chinese Communist Party. It suggests a real fight to gain control of the party at a time when China's top leaders would have wanted to put on a united front, to show power can be handed over smoothly in China. ''The Central Committee of the Communist Party of China (CPC) has decided to suspend his membership of the CPC Central Committee Political Bureau and the CPC Central Committee,'' said an announcement by state news agency Xinhua. Mr Bo's wife, Gu Kailai has been "transferred to the judicial authorities on suspected crime of intentional homicide'' together with Zhang Xiaojun, an orderly who worked for the Bo family, another Xinhua report said. The subsequent front-page People's Daily commentary, entitled "Firm support for correct decision" and republished in the main Chinese newspapers, said that the right action had been taken. ''Bo has seriously violated the party discipline, causing damage to the cause and the image of the party and state,'' the commentary said. China's internet censorship now appears to have kicked into action. Microblogging site Sina Weibo and online forum Baidu Tieba were both filtering posts containing the words ''Bo Xilai'' on Wednesday. Mr Bo's fall from grace began after his police chief Wang Lijun spent a day holed up in the US consulate in Chengdu in early February. It was rumoured that Mr Wang had been attempting to defect. 2 Feb: Chongqing police chief Wang Lijun is demoted, confirming he has fallen out with the city's Communist Party boss, Bo Xilai. 6 Feb: Mr Wang flees to the US consulate in nearby Chengdu, where he spends the night. Many believe he went there to seek asylum. 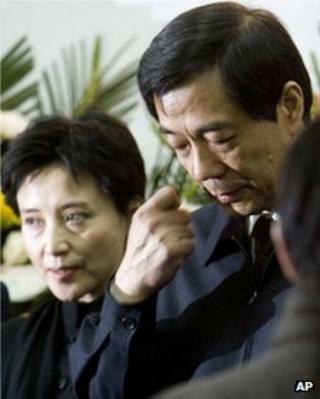 14 Mar: Chinese Premier Wen Jiabao indirectly criticises Bo Xilai for his handling of the affair. 5 Mar: China announces that Bo Xilai has been removed from his post in Chongquing. 20 Mar: Rumours suggest that Mr Bo could be linked to the death of British businessman Neil Heywood, who died in Chongqing last November. 26 Mar: UK government confirms it has asked China to re-examine Mr Heywood's death. The suggestion was that he had been demoted by an angry Mr Bo after the officer had alerted him to the fact that his family was the subject of a police investigation linked to Mr Heywood's death. While in the consulate Mr Wang alleged that Gu Kailai had been involved in murdering Mr Heywood, Xinhua reported. The allegations led to a second investigation. Xinhua said Gu Kailai and her son were in "conflict" with Mr Heywood over "economic issues". "According to reinvestigation results, the existing evidence indicated that Heywood died of homicide, of which [Gu Kailai] and Zhang Xiaojun, an orderly at Bo's home, are highly suspected," the news agency reported. The exact nature of Mr Heywood's role and his relations with the family are unclear and have been the subject of much speculation inside and outside China.